Students in the Dietrich College of Humanities and Social Sciences and College of Engineering joined forces to come up with a plan to decrease the levels of lead in homes in Allegheny County. Students Patrick Dykiert, Connor Cipp and Nick Chmielewski broke down the issue of lead levels into several areas: identifying high-risk zones for lead exposure; determining the accessibility and effectiveness of test kits; assessing the public’s awareness of lead risks and where knowledge can be improved; and the physical mitigation and policy strategies to implement lead abatement and reduce an individual’s risk of exposure. 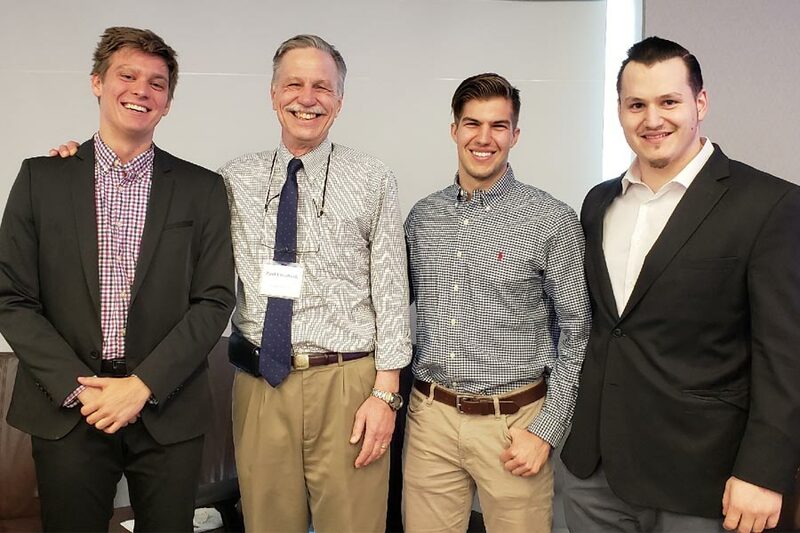 As part of their project, the students built a cost-benefit model and merged that with knowledge from the exposure and mitigation research to develop a decision-making tool for homeowners in Allegheny County. The tool allows homeowners to assess the paint, soil and water lead hazards in their home. Five Carnegie Mellon students won the third annual BrainHub Neurohackathon with their analysis of the interactions between two regions in the brains of mice as they reached for and moved a joystick. The findings could help pave the way for accurately using neural activity to control a video game or computer. The hackathon, organized by Alison Barth, professor of biological sciences and BrainHub's interim director, challenges students from CMU's neuroscience, statistics, machine learning and computer science programs to take existing datasets and make novel interpretations of them in just one day. This year, 55 students on 13 teams entered the contest, with several teams participating from CMU's campuses in Qatar and Rwanda. The winning team, The Deep Nets, looked at data collected by Assistant Professor of Biological Sciences Eric Yttri. Yttri's research focuses on how thought is turned into action in the brain. The dataset he offered to contestants was neural activity collected as two trained mice moved a joystick to collect a reward of sweetened water. The Deep Nets plotted how the data from the motor cortex and striatum brain regions compared to how the joystick ended up being moved. Nominations are now being accepted for the 2018 Andy Awards, the university-wide staff recognition program that honors individuals and teams for outstanding performance in five categories. The categories are: Commitment to Excellence; Commitment to Students; Innovative and Creative Contributions; Spirit; and Teamwork and Collaboration. The nomination deadline is July 13. For more information, including how to submit a nomination, go to the Andy Awards website. Understanding Meaningful Note-taking and Exam Preparation Techniques. Topics will be covered through collaborative activities, group work and discussions. Lunch is included (please specify any dietary restrictions on registration page). Register your student. The Environmental Health and Safety Department will be conducting building evacuation drills this summer between 8 a.m. and 12 noon. The schedule follows. July 19: 8 a.m. - Noon, Pittsburgh Technology Center, Information Networking Institute, Software Engineering Institute, UTDC, Whitfield Hall and 4721 Fifth Ave. Dates are subject to change due to weather conditions. Students Patrick Dykiert, Connor Cipp and Nick Chmielewski (l-r) studied ways to reduce lead levels in Allegheny County homes. The students were advised by Professor Paul Fischbeck, second from left.